Governor Kim Reynolds, a former state senator and county treasurer, serves as Iowa’s 43rd Governor. 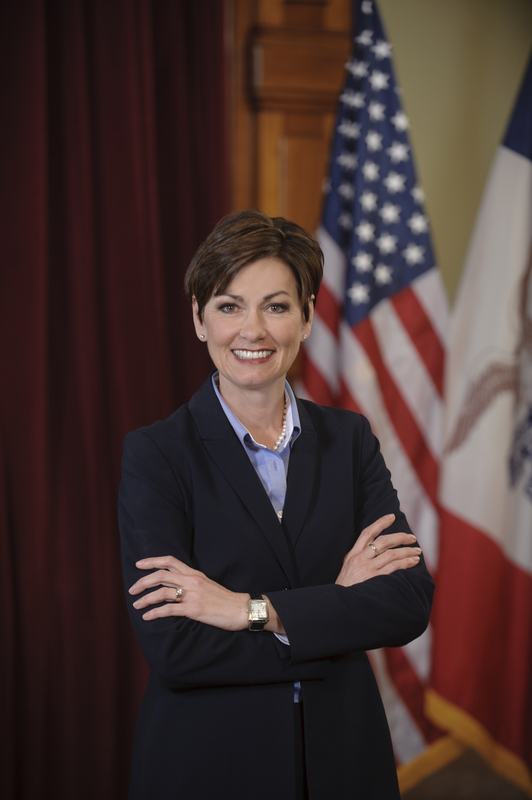 Prior to taking office on May 24, 2017, she served as Iowa’s 45th lt. governor from 2011-2017. Gov. Reynolds truly understands the importance of fiscal responsibility, job creation, education, and technology. Since 2011, Gov. Reynolds has helped attract more than $15 billion in private investment to the state. Companies like Apple, Facebook, Google, Microsoft, CJ Bio America, Cargill, Mid-American, Alliant Energy, CF Industries, and Valent Biosciences, have chosen to locate or expand in our state. Many of these efforts have been a result of establishing long-term relationships overseas that result in increased exports, more foreign direct investment and new jobs for Iowans. In fact, 1 in 5 Iowa jobs are attributed to international trade. Gov. Reynolds’ international trade missions have taken her to China, Germany, Brazil, South Korea, Vietnam, the Philippines, Israel, Argentina, Uruguay and Thailand in pursuit of more rewarding careers for Iowans. During her tenure as lieutenant governor, Gov. Reynolds used her in-depth understanding of Iowa’s small towns and urban communities to continually move Iowa forward with bold economic development initiatives. Iowa Partnership for Economic Progress – an advisory body comprised of CEOs who are focused on job creation, increasing family incomes and enlarging Iowa’s gross state product. Future Ready Iowa Alliance – an alliance tasked with developing and recommending a strategic plan to accomplish the Future Ready Iowa goal of 70% of Iowa’s workforce having education or training beyond high school by the year 2025. Iowa Energy Plan – a group putting together a foundation to maximize and realize Iowa’s economic potential, building on past energy successes and laying the ground work necessary to reaffirm Iowa’s energy leadership into the future. In April 2017, Iowa Workforce Development announced that the state of Iowa’s unemployment had fallen to 3.1%, well below the national average and 8th lowest in the country. Gov. Reynolds has committed to visiting all of Iowa’s 99 counties to learn about how Iowa can become an even stronger state. Whether it’s meeting with business owners or rural farmers, she embraces the opportunity to gain insights into their concerns or encourage collaboration. She and her husband Kevin reside in Osceola. They are proud parents to three grown daughters: Nicole (Ryan Springer), Jen (Jason Fagan), and Jess (Scot Enger), and have nine grandchildren.